This entry was posted in D/G Blog, FIA and tagged D/G fic exchange, epic fail, epic R/Hr fail, H/G fail, Harry/Hermione. Bookmark the permalink. 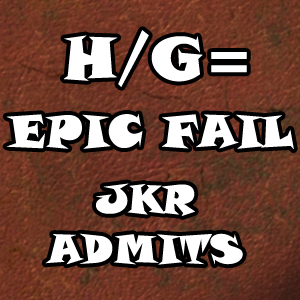 Nowhere does she say H/G is a fail though. In fact, she doesn’t even say H/Hr should be together, she only comments on R/Hr. If anything, Ron and Hermione should have probably ended up with other partners, but Harry would’ve definitely stayed with Ginny. Sorry to disappoint you. A troll… our very first trolly troll! Yay! Look, honey, I’ve been participating in and running FIA for 12 years now. I’ve written over 40 D/G fics. We know what we’re talking about. And please go back and read the article BEFORE commenting on it. Trust me… I’m not disappointed at all. I wouldn’t have been disappointed with H/G in canon if only it had been better done. Many years ago, someone over at FIA pointed out that JKR is a terrible romance writer, and I think that is true. No good romance writer would have thought canon Ron/Hermione was worth perusing. She was great at world-building and names (very, very important). She created a wonderful synthesis of some of the most beloved forms of fiction of the 19th and 20th century. But she really wasn’t a terribly brave writer, and a compelling romance means taking a few chances if you are going to avoid a formula. So in the end, it may not matter. I am not sure she would have been able to carry off D/G or even H/Hr. Luckily, we have lots of good writers who can.